mix yoghurt, coriander leaves, mint leaves, curry leaves, cumin seeds, coriander seeds, aniseed powder, green chillies, garlic, ginger, turmeric powder, lime juice and poppy seed paste and marinate the chicken in it. Keep aside for 1/2 an hour. heat clarified butter in pan. Add cinnamon, 1 bay leaf, cardamom seeds, curry leaves and cloves. Add onions and sweat till they turn translucent. Add washed and cleaned rice. Cook till rice turns translucent. Add water. When water comes to a boil, turn flame to low and cover pan. Cook on low flame for at least 15 minutes. The rice is done. Cover pan and cook for at least 5 minutes on a medium flame. Remove cover and cook on low flame for another 10 minutes to allow gravy to thicken. Layer the serving bowl with alternating layers of rice and the chicken masala. 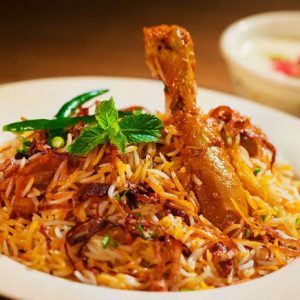 Feel free to comment or share your thoughts on this Calicut Chicken Biryani Recipe from Awesome Cuisine.